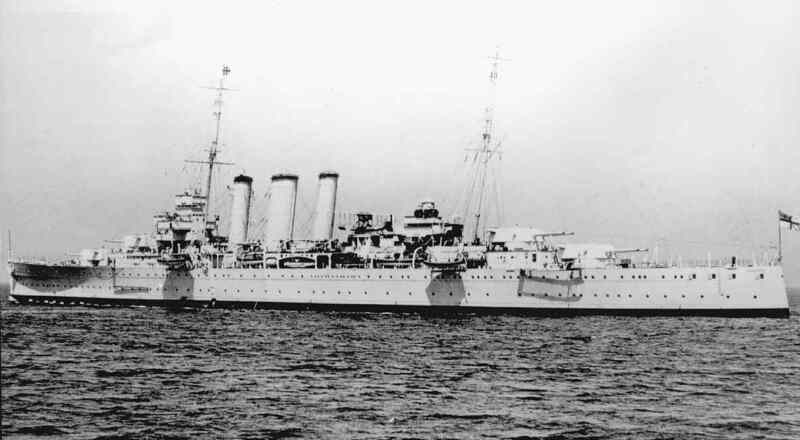 KENT-Class cruiser ordered from John Brown, Clydebank on 9th April 1925 under the 1924 build programme and laid down on 31st May 1925. The ship was launched on 31st May 1927. She was the first Royal Australian Navy ship to carry the name. Build was completed on 10th July 1928. Deployed in Indian Ocean for defence of trade. Trade defence duties in continuation. Transferred to RN control. Escorted military convoy US2 which including rms QUEEN MARY, rms MAURITANIA and seven other passenger liners with HM Cruisers AUSTRALIA (RAN), PERTH (RAN) and LEANDER (RNZN). Deployed in Indian Ocean for convoy defence and Interception of commerce raiders. Escorted Sydney - Fremantle convoys. Searched for raiders off Cocos Islands with PERTH (RAN). 28th - Escorted military Convoy US3 with HMAS PERTH during passage to Ceylon. Indian Ocean convoy defence and patrol in continuation. Under refit. Close range anti-aircraft defence improved by fitting 8 barrelled Pom-Pom mountings and 20mm Oerlikons. Resumed Indian Ocean duties. Escorted military convoy US9 in Indian Ocean. Relieved by HM Cruiser LEANDER. Indian Ocean interception and trade defence duty in continuation. 4th - Intercepted German freighter COBURG and captured Norwegian tanker KETTY BROVIG. Deployed with HM Cruiser LEANDER in Indian Ocean. 10th - Joined military convoy WS 6 as relief for HM Cruiser PHOEBE. 11th - After detaching from WS6 resumed trade defence and interception duty. Transferred to ANZAC Squadron for convoy defence against attacks by German commerce raiders in Indian Ocean and East Indies area. ANZAC Squadron deployment in continuation. (See OPERATION PACIFIC by Edwyn Gray). Deployed with HMAS PERTH for convoy defence. After outbreak of war with Japan transferred to defence of military convoys in SW Pacific. Escorted US troop convoy with HMAS PERTH and HMNZS ACHILLES for the final stage of passage to New Caledonia. 28th - Escorted convoy ZK5 from Sydney to Port Moresby with cruisers HMAS AUSTRALIA, PERTH and HMNZS ACHILLES. Military convoy defence in SW Pacific in continuation. Escorted military convoy from New Zealand to Suva. Transferred to Indian Ocean for convoy defence. 30th - At Sydney during Japanese midget submarine attacks on shipping. Nominated for duty with US Navy. (For details of naval activities in SW Pacific see USN NAVAL OPERATIONS IN WW2 by SE Morison). Prepared for duty with US Navy. 10th - Sailed from Sydney with HMAS AUSTRALIA, HOBART and US cruisers CHICAGO and SALT LAKE CITY as Task Force 44 for support of US amphibious Operations and convoy defence in SW Pacific. 7th - Deployed on patrol off Talus with HMAS AUSTRALIA, USS CHICAGO and two destroyers of US Navy. 9th - In action with Japanese cruisers CHOKAI, AOKA, KAKO, KINUGASA and FURUTAKI south of Savo Island whilst in low state of readiness. Set on fire and received major damage after repeated hits by 5in shells and by four torpedoes. 84 of ship's company were killed. (Casualty List - note on casualties).